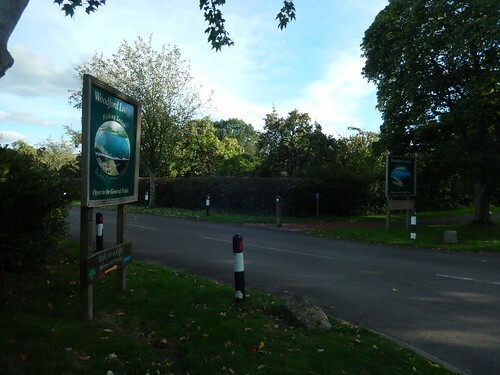 I decided to start from Herriotts Bridge, which is a road crossing the southern end of the lake, with free-to-use parking laybys on either side. In the summer and on weekends, you’ll typically find an ice cream van here. 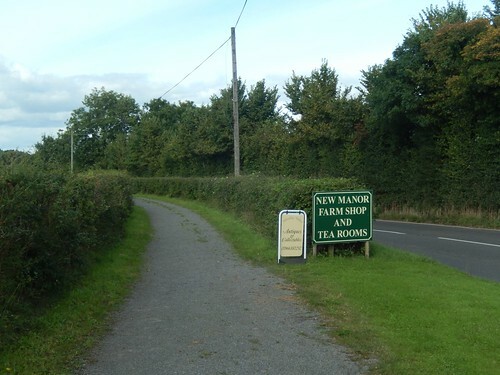 With no direct access to the lake already, I would begin by following the A368 in a slight north-easterly direction towards New Manor Farm, where the road then turns north. For most visitors, I presume this is as far as they would walk, with an abrupt end to the roadside pavement and the offering of a tea shop on the left. 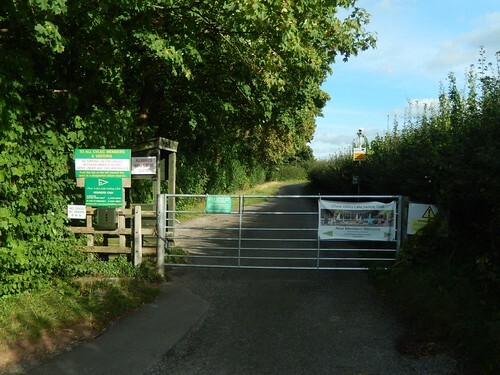 At the bottom of this lane and, just beyond a turning circle for cars, I quickly realised that public access beyond the wooden gate was restricted only to permit holders… Back up to the road, I must go. 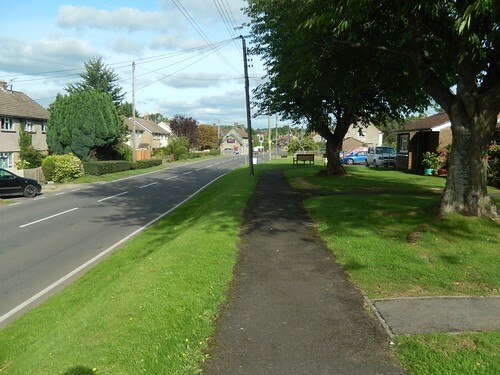 From Sutton Wick, a pavement materialised in front of me and I was now walking in to Bishop Sutton. I could see, from my map, that there would soon be a footpath on my left – it was next door to the Indian restaurant (possibly a former pub) that you can see in my photo, above. This lead me down beside the pitch belonging to Bishop Sutton AFC. 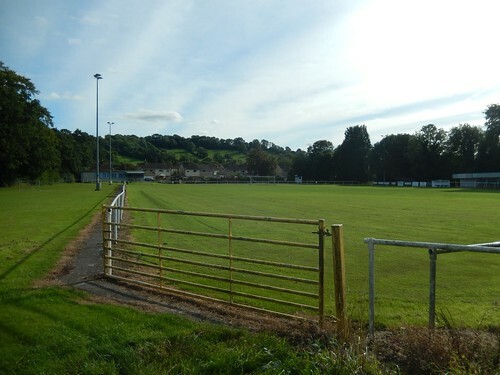 Despite being an amateur or semi-pro side, they have a small stadium for supporters. Their home ground is called ‘Lakeview’ but I could not see the water. 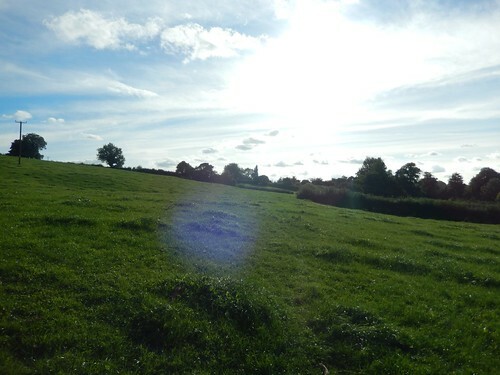 Beyond another field, I arrived at Stitchings Shord Lane, with the farm immediately to my left. 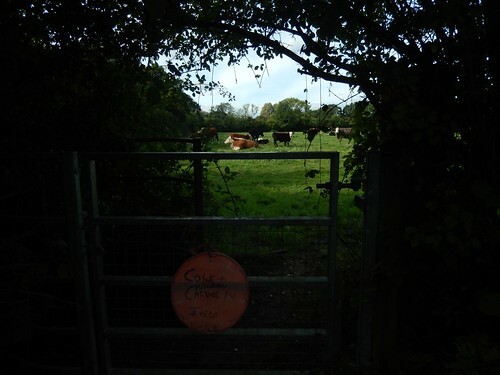 I had intended to take a footpath passing west of the nearby caravan site but the orange sign warning of ‘cows with calves’ on the gate put me off. There must’ve been at least thirty of them in there. Another footpath would soon give me the option of crossing this same land but along the other end. It appeared to follow a long private driveway towards a house and I didn’t have the confidence to face even that. 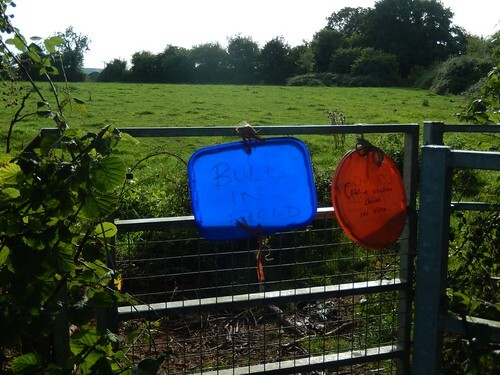 Following Ham Lane northwards now, I felt I had made the right choice in sticking to the roads, as I passed the tail-end of that previous footpath, where an additional blue sign warns: ‘bull in field’. Further warnings signs lay in wait to my left, as I walked towards Twy Cross Farm. ‘Commit a crime here and you will be forensically tagged’! Following another dead-end road in the hopes of reaching the water’s edge, I came to another point at which Bristol Water say ‘no’. 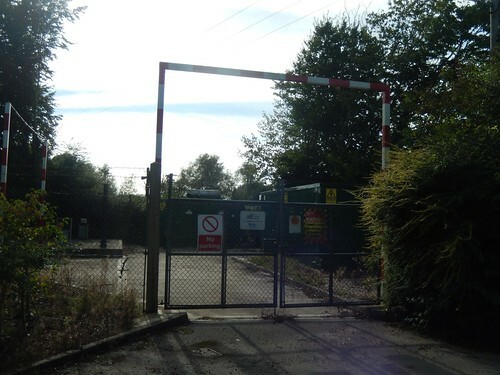 On the way down to this gate, I’d noticed a pair of unmarked paths leading off in to Brook Copse on my right… A trespassers diversion? They looked too large to be animal tracks and so, I followed them. 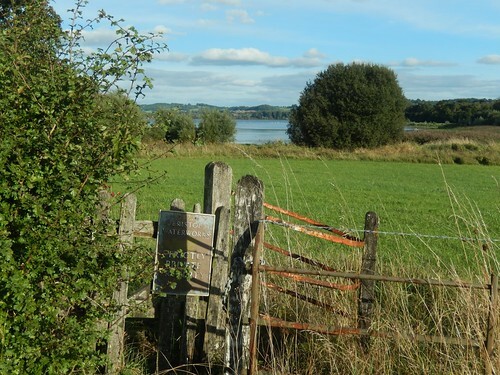 Of course, the Bittern Trail isn’t marked on an OS map. 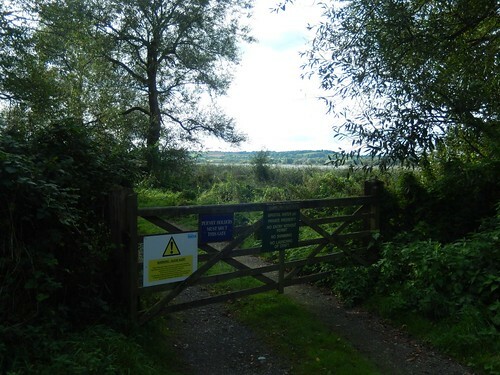 Yet, just south of here, there is definitely a bird-watching hide and I’ve read that this trail leads to it… But surely, that also crosses the land (and perhaps the gate) that is reserved for permit holders? 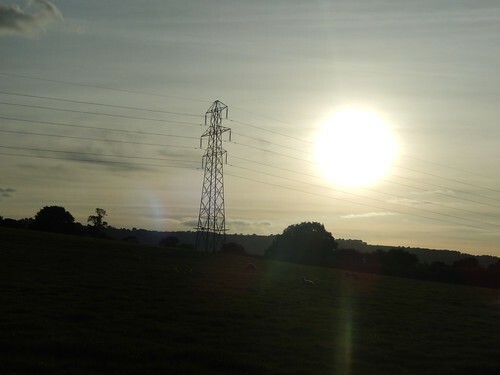 One day, I’ll head back and investigate this further. Now, with a view on the water at last, I was walking on the familiar, hard-pathed Glebe Trail; gradually making my way northwards, through two car parks and in the direction of the popular café. I knew, from previous experience, that this is about as close as you’re going to get to the water along the eastern edge of the lake. While the path was easy to follow, it wasn’t without its warning signs… Do not steal fish? Do not cook fish? Do not become a fish?! A restriction for ‘fisherman only’, with a similar sign further ahead. 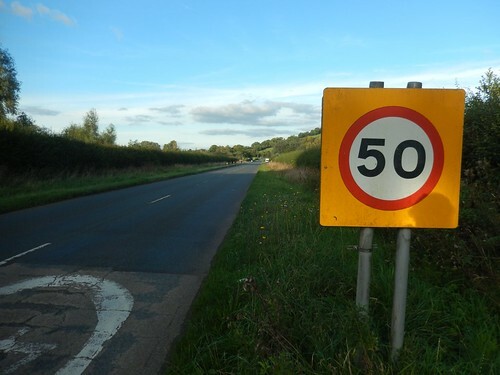 I think I’m right in saying that access is largely prohibited in the aim of conserving the local wildlife. 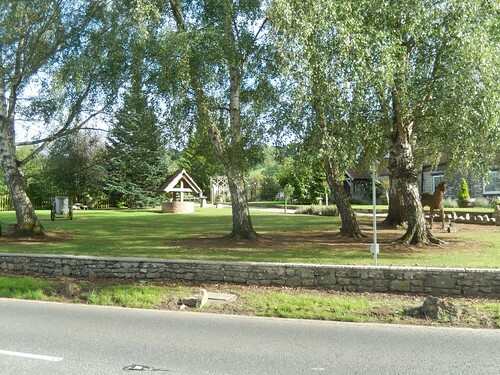 Some of the views are excellent – while both car parks here are pay and display. 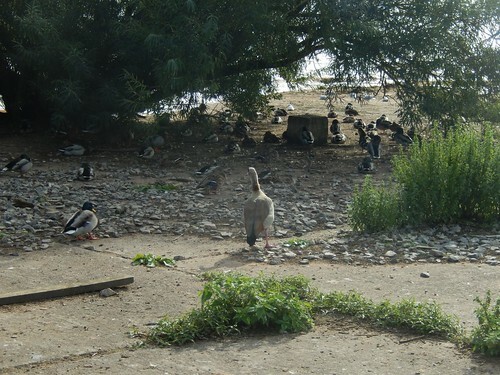 There was the usual flurry of bird and ducks at the north-eastern corner. 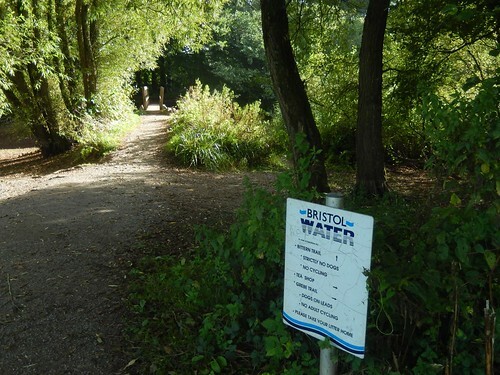 But for another locked gate, you would be able to bathe your feet in Bristol’s drinking water. This is often a very popular spot at weekends. I was about to follow a pavement along Walley Lane, which follows the entire northern edge of the lake. It may be right next to a road but I’d experienced worse on this walk. This short stint also follows the 2 Rivers Way. 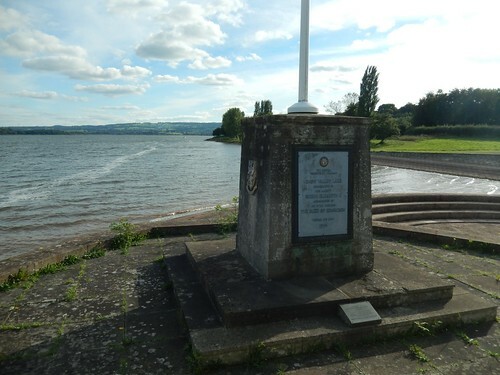 Which commemorates the opening of Chew Valley Lake by Queen Elizabeth II and the Duke of Edinburgh, back in 1956. 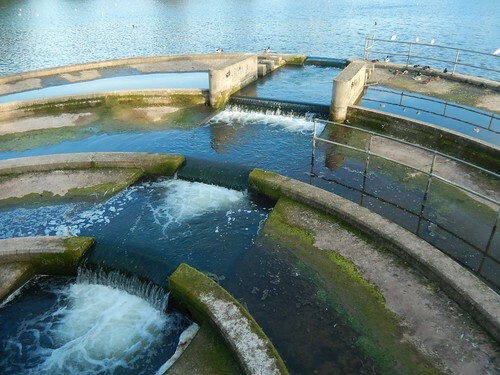 Across the road, you would find Bristol Water. 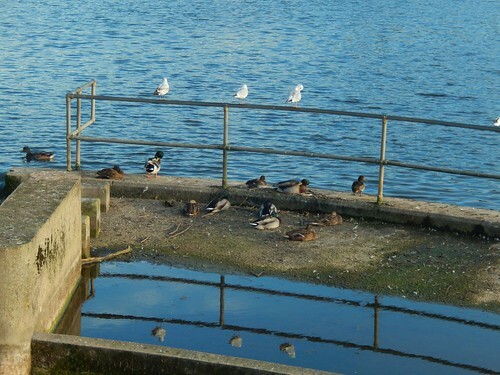 I had my sights set on the local sailing club, in my next attempt to get close to the water’s edge. Of course, that was always going to be blocked. I had not expected the CCTV cameras! 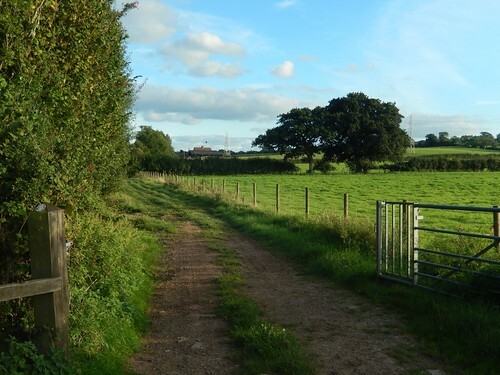 From Wallycourt Road, I followed a footpath, crossing fields in the direction of Fairseat Farm. An unmarked lane might’ve otherwise led me to the sailing club’s jetty and another locked gate with CCTV. 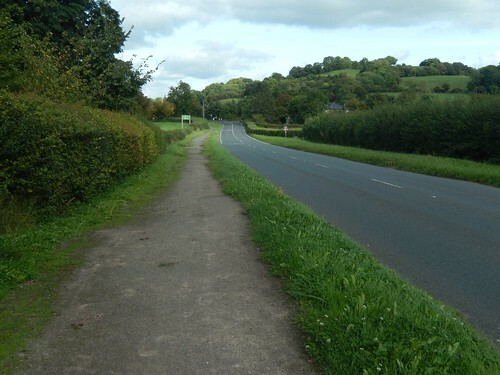 Now in Chew Stoke, I walked south along the B3114. 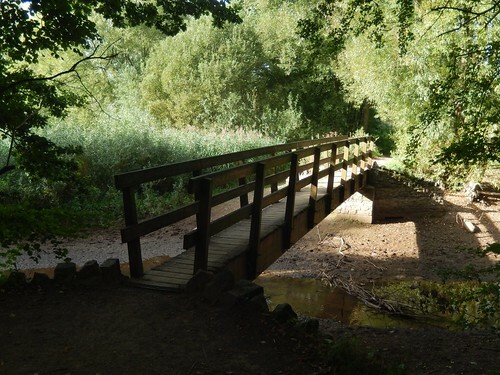 Despite being over hallfway in my circumnavigate of the lake, there was still some way to go and, as I found early in to this walk; the pavement, here, was also in short supply. 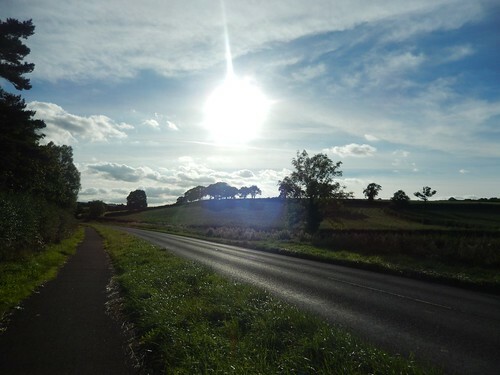 I was quite relieved when I eventually joined a cycle path – I will rarely ever say that! I noticed the entrance to Woodford Lodge as inviting – certainly, a lot more so than the way in to the sailing club’s premises! Ironically, it looks as though the restaurant closed down a year ago. There was nothing to suggest a waterside walk from here but I do wonder I could’ve bypassed some of the previous road walking… As unlikely as it seems. From here on, I felt confident there would be no more ‘difficult bits’. I’d begun to accept that it was unlikely I’d find myself beside the water again and I was on the home stretch. Again, I encountered signs warning of private property and a lack of public access beyond. There’s another fairly popular car-parking location between Herons Green and Herons Green Bay. There is no parking charge but you are right beside the road and its fast-moving traffic. Being on the western side of the lake, it’s possibly a good spot to come and watch the sun rise. 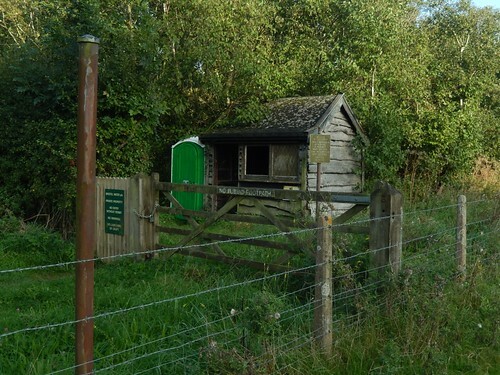 By now, I’d apparently passed another birdwatching hide, near Nunnery Copse. Strange, how I didn’t spot it at the time. There must’ve been another restricted access sign in my way. I graciously left this road just north of Summerlea Farm and, at the end of a lane, followed a succession of vaguely familiar fields that I hadn’t walked for almost four years, perhaps. 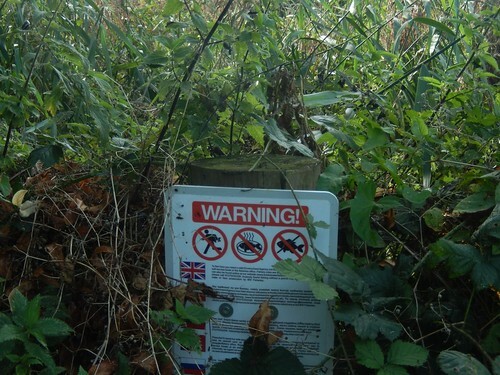 There was another warning sign at the end of Stratford Lane, where something more closely resembling a sentry’s station (as opposed to a birdwatching hide) could be seen. Fortunately, a public right of way does exist on this side of the fence. This would lead me on to a track, heading south towards Lower Gurney Farm. Where some landowners can be criticised, this one deserves a lot of credit for the clear direction of the permissive route. I may be wrong but I think it previously continued through the farm yard. 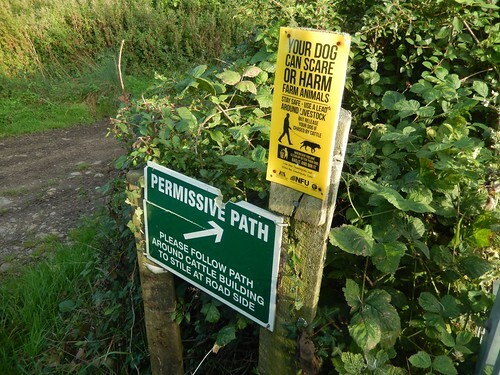 Footpaths are rights of way are prone to change (especially when permissive) and it can be hard for Ordnance Survey to keep up to date. 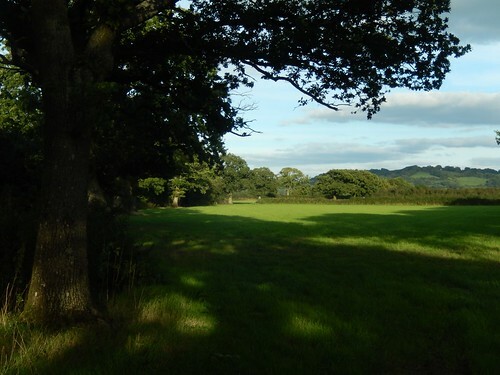 Any effort a landowner can make is greatly appreciable. 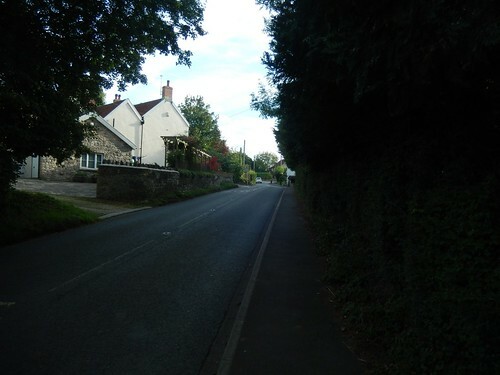 Again, I found myself walk along the A368, as I had done in the beginning. But for a shorter stretcher, with a grass verge available and my car in plain sight. Instead of rushing to the car to change my footwear, I spent a few minutes observing the wildlife of Herriotts Mill Pool. 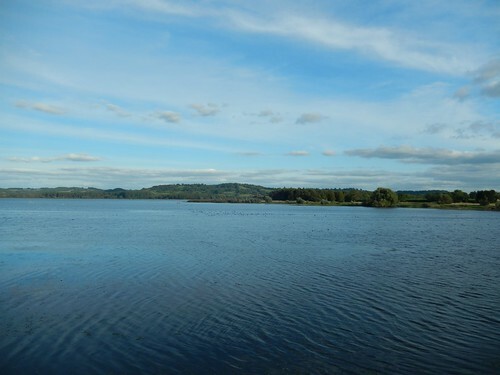 So, can you walk around Chew Valley Lake? Yes… But only in very few places, can you get good views of the water. Probably not. Unless you’re a permit holder. 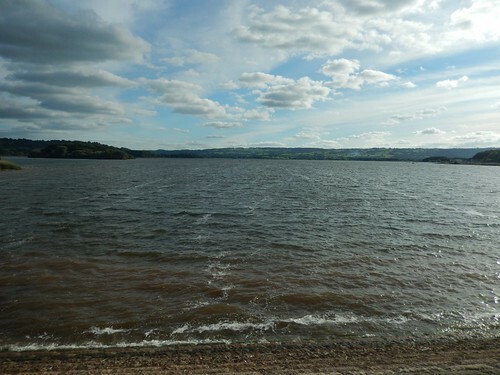 I’m pleased to have answered this question for myself and using my own two feet, having done the same with Blagdon Lake, a couple of years ago. 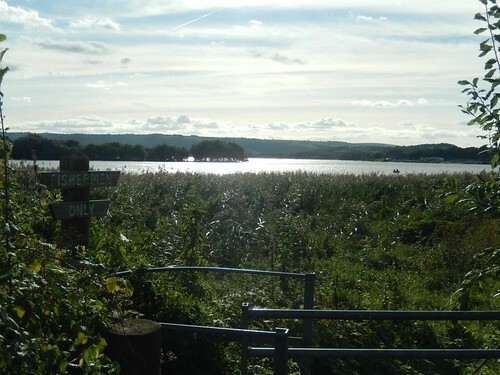 I didn’t find a clear answer with Google and I like to think I am the first person to have attempted this perambulation of Chew Valley Lake… 😉 However, I doubt that’s actually true. 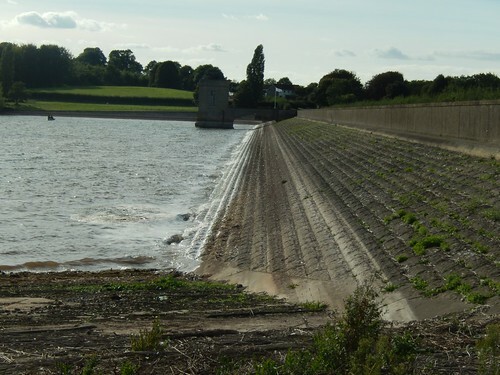 I’m surprised you’re able to get close to a drinking water reservoir, much less boat on it! In the Seattle area here in the US, I took a tour of the cities’ drinking water source and it was fenced off, underground, or well-away from any access point. Nice write up; I enjoyed the many pics. Hi Joe – thank you. Yeah, I can understand why it would be fenced off. 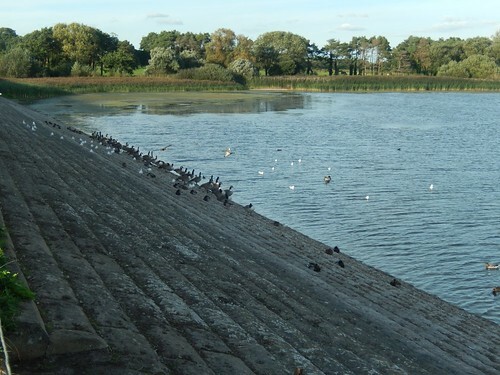 We still have the occasional underground reservoir in the UK but most of the ones I come across are now redundant. Well done, Olly, for your perseverance. 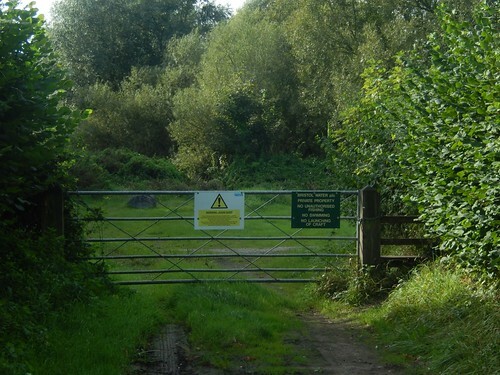 Disappointing to find so much restricted access and I guess they only allow permit holders because they sell permits and make money off them, Shame on Bristol Water. Could do better. 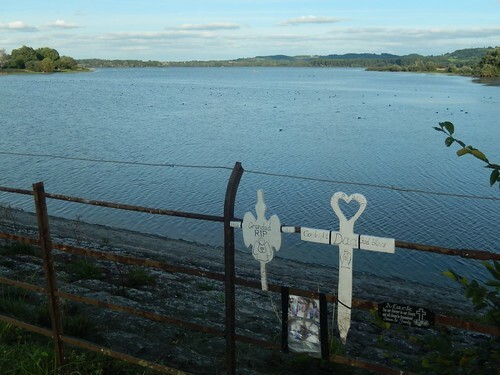 Hi Ruth – it’s the same at nearby Blagdon Lake as well – where, ironically, there is a paved path running close to those ‘restricted’ parts of the lake… I read elsewhere that it also relates wildlife conservation. 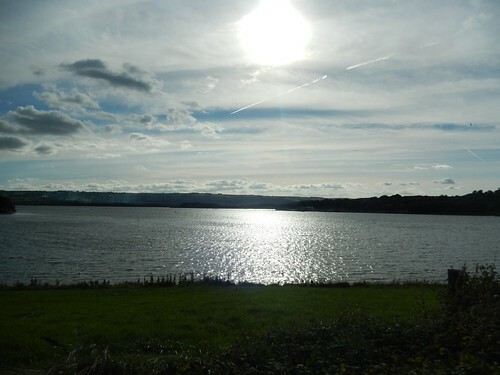 It’s a shame that so much of Chew Valley Lake is not available to walk around and I hope that may one day change. Many thanks for the article. I’m thinking about running round. You are far more polite than I am. 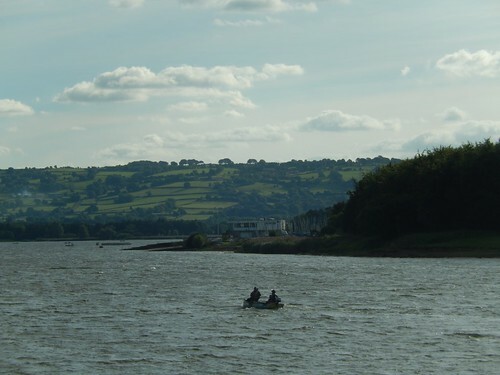 I ran straight through the sailing club, smiling at folks like a club member (that’s what I thought :)) – came upon Bristol Waters own cafe then a ‘private’ Bristol Waters path and road. 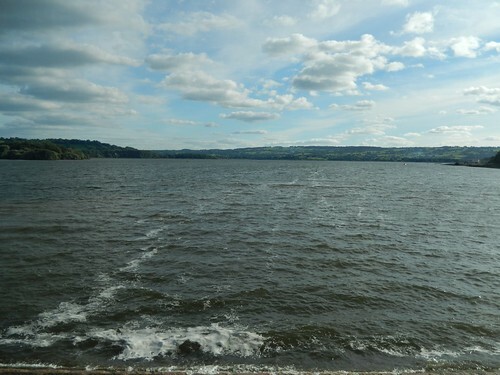 But your right – it’s a bugger to try and walk/run around the edge of the lake. Thanks a very useful post as I was considering walking this myself. I’ve since been told that by purchasing a permit you can gain access to some other areas closer to the lake. 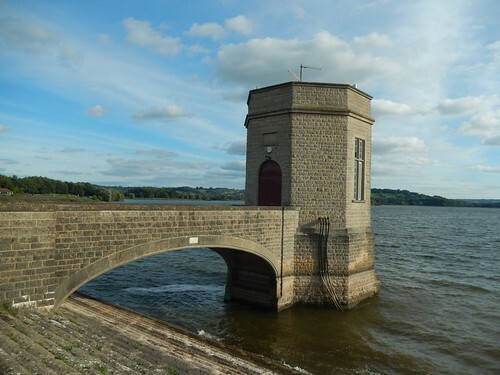 I think it also provides greater access around Blagdon Lake. 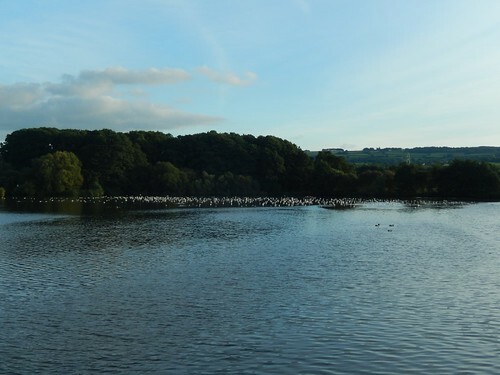 Some of the lake is designated as a nature reserve where public access is restricted to reduce disturbance to, for example, water birds amongst others. Thanks for your comment. 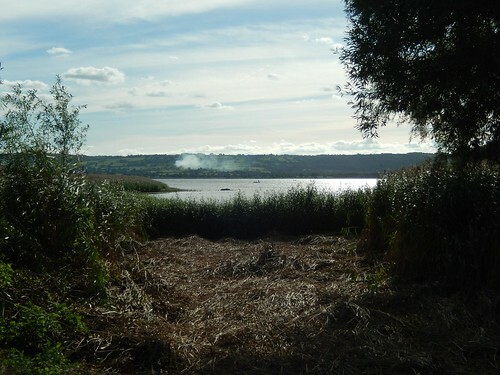 A friend of mine told me about this not long after I wrote this and I believe the situation is similar at Blagdon Lake.